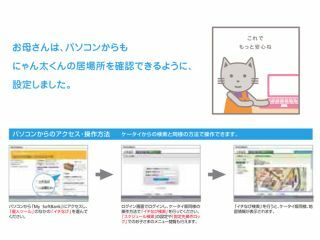 Softbank hopes both people and cartoon cats will easily find their lost mobile phones. Over in Japan, Softbank Mobile - the brand Vodafone Japan transformed into last year - is about to launch a service that will surely appeal to the nation's legendary drunken Friday-night salarymen who seem to have a habit of leaving their phones anywhere but their pockets. The company's new ' Ichi Navi ' service uses the GPS chips embedded in many Softbank phones to trace missing handsets online via a PC interface. Phones have to be registered in advance and there's a ¥210 (85p) monthly charge plus ¥5.25 (2p) per search, but this is bound to be a life saver many times over for the typical corporate warrior on a bender. Search results yield either a Yahoo Map location result so the phone can be retrieved, or a message saying whatever the Japanese is for "We think it's in the toilet , pal."